Alternative metals are experiencing a surge in popularity. Taking a cue from our loyal customers, we are proud to introduce the men’s benchmark black titanium wedding ring with concave design. This ring is the perfect style staple for any man that prefers a monochrome palette for his everyday ensemble. With such architectural detail, don’t be surprised if this ring demands double takes everywhere you go. Each 7.5mm men’s benchmark black titanium wedding ring with concave design features a satin finish, rounded edges, and a comfort fit interior. Comfort fit rings are the perfect choice for men with large knuckles, because they are made with extra metal to create a domed effect. We recommend that you have your ring finger measured by a professional jeweler, because comfort fit rings usually measure a half size smaller than rings with a standard fit. Each 7.5mm men’s benchmark black titanium wedding ring with concave design features aircraft-grade titanium that will never scratch, tarnish, or lose its shine. Titanium is quickly surpassing precious metals as one of the most popular choices for wedding bands and jewelry. If you aren’t afraid to roll your sleeves up and get a little dirty, titanium offers superior crack resistance. However, titanium can only be removed by a professional jeweler’s saw in the event of an emergency. You will not be able to have your ring resized over time, but the low cost of titanium ensures that you can easily replace your ring if it is ever lost, stolen, or cut off. 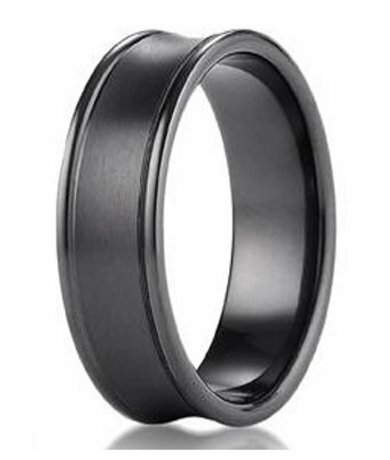 If you have any questions about our men’s benchmark black titanium wedding ring with concave design, please don’t hesitate to contact JustMensRings.com for additional information.